Don’t feel like reading? Check out this video analysis instead. If you have followed my work on game monetization, you will know that much of monetization happens in the UI/UX layer. The motivation to spend must come from the fun factor of the game itself, but thoughtful UI flows that balance making purchasing present with respect for the player are key to good monetization. With that in mind, I wanted to quickly touch on five monetization missteps Midnight Star makes with its presentation layer. As is common in free-to-play games, upgrades in Midnight Star have both a currency cost and a time cost. 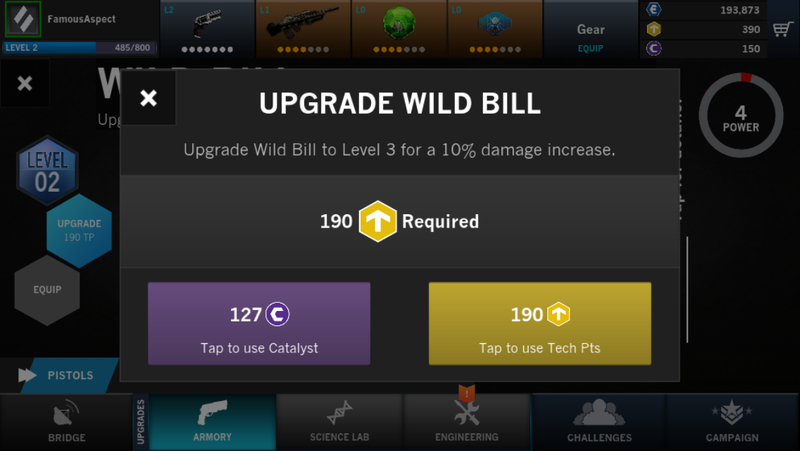 When evaluating an upgrade, the player can either make a purchase with Tech Pts (one of two soft currencies) or Catalyst (the hard currency). Only after the player chooses to upgrade with soft currency are they presented with the time cost and asked to skip it for hard currency. 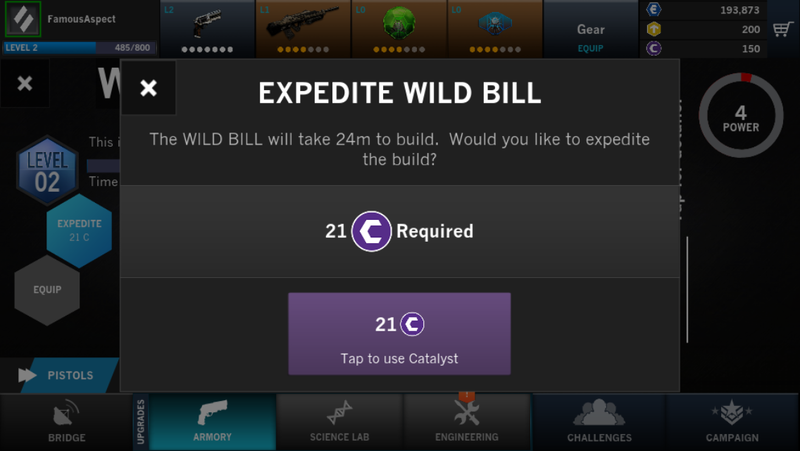 I assume that the benefit of using Catalyst is to skip the timer, although I am unsure since I haven’t made a hard currency upgrade purchase yet. Regardless, it is much better to provide the player with all of the information they need to make an informed purchase up front instead of surprising them with a timer. This hidden time gating is exactly the sort of free-to-play tactic that will be a turn off for core gamers hoping that Midnight Star is the Halo of mobile gaming. Levels in Midnight Star are fairly lengthy affairs for mobile. Levels I’ve played so far have taken between 8 and 13 minutes to complete. These levels are broken up with checkpoints every few minutes. At first blush, it appeared that Midnight Star did not use energy gating. 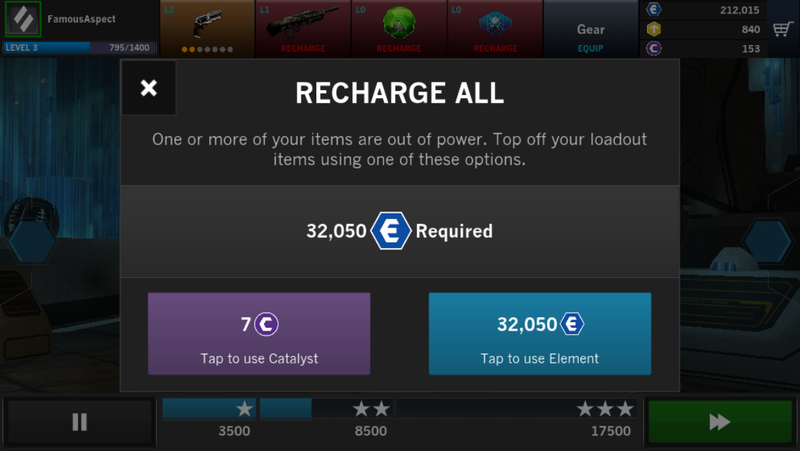 But when I was blocked mid-level with the screen above I discovered there was energy gating in the form of recharging my loadout either using Element (the game’s other soft currency) or Catalyst. I am not opposed to energy gating. However, gating the player 6 minutes into a 12 minute level is jarring. Instead of a clean separation between monetization and gameplay, the game space is interrupted with a blocking pop up requiring the player to spend soft or hard currency. I believe players would be more receptive to a clear, upfront energy requirement to enter a level than one that surprises them mid-session. If you are noticing a theme here it is hiding or surprising the player with a form of monetization offer. 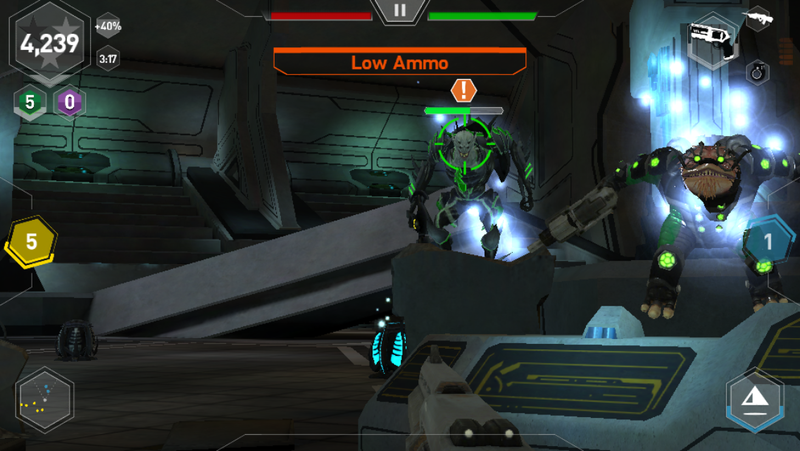 In addition to occasionally being forced to spend currency on energy, the mid-level checkpoints also offer to sell the player health for soft currency. Unlike the energy gating, I think this health offer is well placed. However, the user interface for the offer shown above creates an unnecessary level of confusion. 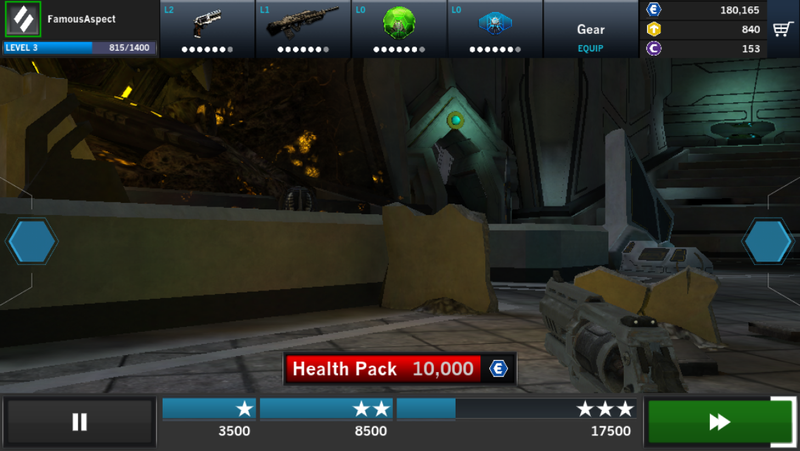 When I initially encountered the time-limited health upsell, I thought “how should I know if I need to buy health if they hide my health bar.” Only on inspecting the user interface for the upsell offer was it clear to me that the red bar behind the text represented my current health. I was expecting to see the health display as it is shown in level, pictured here with a red bar on the top UI that depletes left to right, balanced out by a green bar for my shield energy. 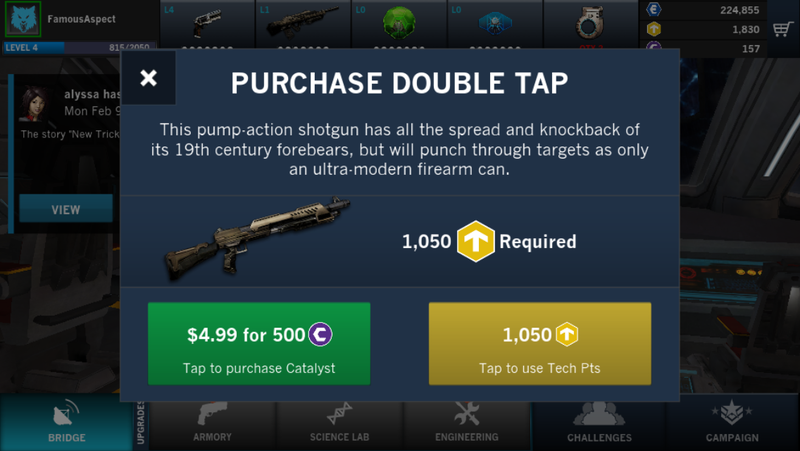 Instead of showing this UI element on the checkpoint screen, they show it as a bar in the offer that depletes right to left. A small issue, no doubt, but one that is unnecessarily confusing on a screen with a quick countdown timer. A simple fix would be to show both the health upsell and the health indicator the player is familiar with. One way that a free-to-play game can make a player feel as though the game views them as a wallet first and a person second is to be too aggressive with upsell pop-ups. I find it to be a less pushy tactic if these upsell offers are built into existing UI flows where the player is also receiving important information instead of presenting blocking pop-ups to the player. Whenever I begin a session of Midnight Star I am presented with a purchase or upgrade dialog like the one above. Whenever I finish a level and return to the ship interface, I am presented with a purchase or upgrade dialog. This implementation makes Midnight Star feel like it constantly has its hand out asking me to open up my wallet. One hypothesis is that this pop up system was implemented because not enough players were spending currency on item upgrades. A more elegant solution would be to build a recommended upgrade widget into either a pre or post level UI flow where it is paired with valuable information. In most free-to-play games, a currency upsell is triggered whenever a player attempts to buy an item that costs more hard currency than they currently possess. In Midnight Star, instead of upselling hard currency contextually, when the player does not have enough currency it transforms the Catalyst button into a sale itself. I find this implementation off-putting for two reasons. The first is that it hides the cost of the item. 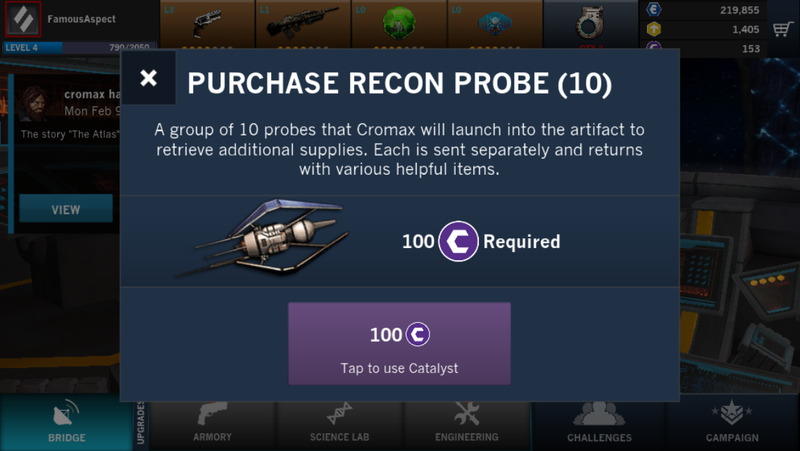 Perhaps a player is very close to earning the required Catalyst and it would make more sense to grind for it instead of spending money. The second reason is that the dialog only offers the player the least efficient currency package. Although this is also the lowest cost package, if a player is willing to spend money then they may opt for a larger package where they get more bang for their buck. At the very least, turning the Catalyst button into a sales button should not hide the cost. But in this instance I would defer to the standard flow instead of forcing the currency sale on the player. On its own, each one of these issues is relatively small. However, when you add them all up, the monetization decisions in Midnight Star communicate to the player how the game views them. One of my core mantras as a game monetization consultant is “players not wallets.” Although the team at Industrial Toys talks the talk when it comes to valuing long term engagement over monetization, small tweaks to their UI around monetization would help them do a better job of walking the walk.